The Barton Highway is a key link on the Sydney-Melbourne corridor, connecting the ACT to the Hume Highway. 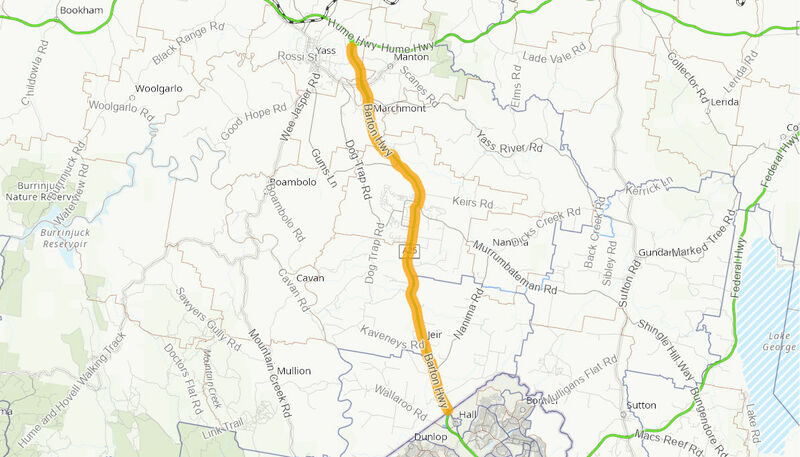 The 32.5 kilometres of the Barton Highway between the ACT border and the Hume Highway is a single carriageway, mostly two lane rural road with a number of overtaking lanes. The works involved identification of the corridor for possible future duplication, some land acquisition and reservation of the corridor. The road boundaries have been provided to Yass Valley Council for inclusion in the Council’s Local Environment Plan. This will preserve the road corridor boundaries to allow for future upgrade to the Hume Highway in the area. The Australian Government is fully funding the $5,150,000 project. A display of the duplication corridor for environmental investigation was held in May 2008. Corridor boundaries for duplication were finalised included in Council's Local Environmental Plan from 19 July 2013.